You know what I love to do in Silhouette Studio? 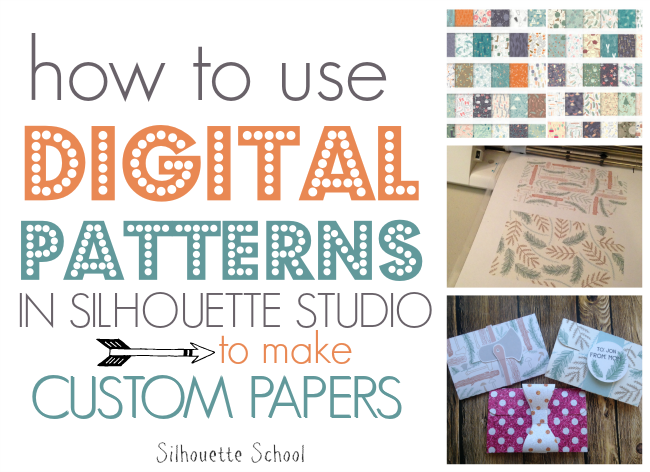 I love to use digi scrapbook paper aka digital patterns to make custom papers. It's perfect for those times when you need just a small piece of a patterned paper and you don't want to run to the store or you can't find exactly what you're looking for. The secret is seamless patterns and the My Patterns folder and you're in luck because right about now I'm going to tell you where to get a whole slew of awesome digital patterns!! 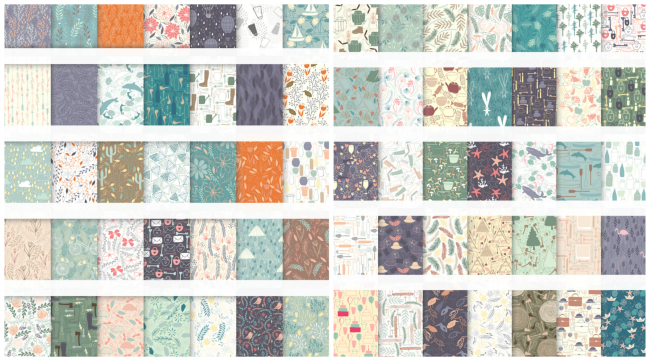 You'll need Silhouette Studio Designer Edition to add custom patterns to your My Patterns library so I encourage you (once again) to grab the one-time paid upgrade. I bet you see one you like....how about 70? OMG they're all awesome!! Start by finding a pattern you like and download the PNG version to your computer. I prefer to save to my desktop so it's easy to find. For this example, I used Pattern_7 and Pattern 68. Now, open up Silhouette Studio and click on the Library icon. Within the library you want to click on the My Patterns folder. At this point you can literally drag and drop the Pattern_7.PNG file into the My Pattern folder. It may take a second, but the new custom pattern will load and will appear in alphabetical order. And now you're wondering - Okay, so where do I find them in Silhouette Studio? 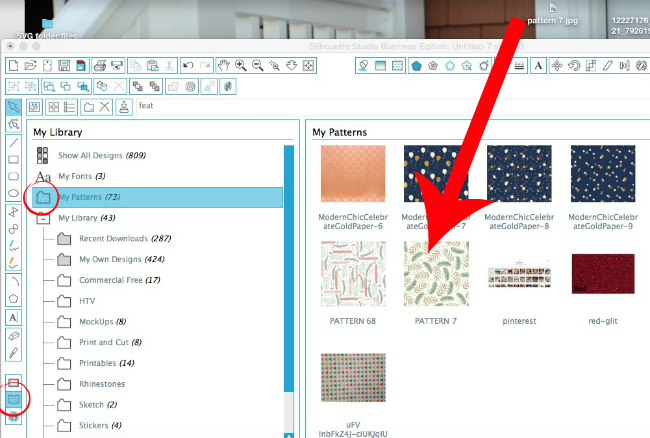 The custom patterns can be found by clicking the Fill Patterns tool. 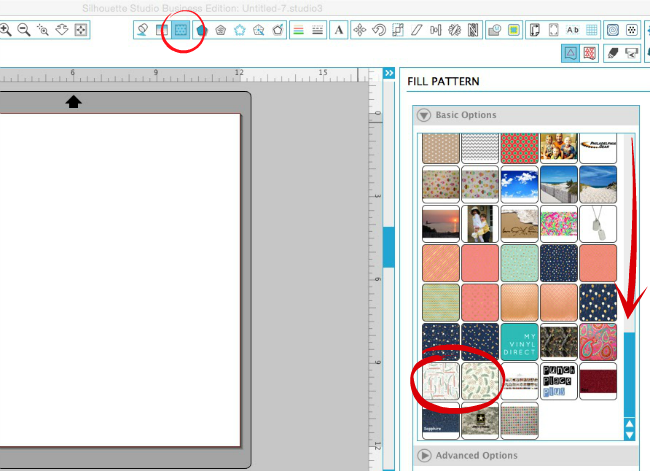 When the window opens, scroll down and the custom digi papers in the My Patterns folder are towards the bottom under the default patterns. All you have to do now is open a shape > select shape > click the pattern thumbnail you wish to have fill the shape. If you click 'Advanced Options' you'll be able to scale the pattern larger or smaller and pan it to get it just how you want it to appear within the shape. The great thing about seamless patterns is no matter how small you scale the pattern - 5% above - you won't get those lines like you do with some other custom fills (18% below). Also - you can trace portions of the pattern to make accent pieces like I did for the ax and branch on my gift cards. If the trace picks up unwanted areas around the shape you're going for > right click > release compound path > delete unwanted areas. Use the fill color picker to match the color. Then you simply do a print and cut and you've created your own custom scrapbook paper! I mean how cute are these custom gift card holders? I'll be sharing the free cut file with you just in time for Christmas so be on the lookout! And not that all the digital patterns in this month's bundle from The Hungry JPEG aren't worth it enough - but look what else is included in The December Bundle! There are 30 fonts and more than 1500 graphic elements. And of course you get all the commercial licenses included and all for just $29. Ya can't beat it! I could go on and on and on but you get the point...hop on over to grab The December Bundle before it expires at the end of the month! Thank You so much for this tutorial! You are amazing! Like you, I love the convenience of digi paper when I need something specific and don't have actual paper in hand. I've found quite a few needed prints off Etsy. Great article! Hope someone's listening. Education plays an important for good life and especially primary education. Every student must be educated and taught from very beginning for their betterment and good future. Mayoor Noida provides all the basic education with best facilities and infrastructure. I pulled this pack and the patterns shown in the blog are actually are JPG files not PNG. How would I convert them? When trying to drag and drop the files I get a circle with a line through it as soon as I enter the Silhouette space. Any tips? This happens with both the JPG and PNG files. If I go to File, Open, desktop and select the item it imports it. However with JPG files they come in very large. They also won't allow items saved to my library to be dragged to the patterns file. I tried every option I could think of also and could not get my papers to save to the patterns folder - only into the library. I'd love a solution, too! Thanks. ohhh Thanks you, it so amazing and beautiful.